Published on 31 January, 2015 in Tech. 2 Comments Tags: ubuntu touch. I figured it was time to re-visit Ubuntu Touch on my Nexus 4 and see how it was going. I was already running stock Lollipop and just kicked up the Ubuntu 14.10 GNOME live image under KVM on my Korora 21 laptop and passed the USB device through. Following the instructions was really easy to get it going. Actually it was just one command and I was soon booting into Ubuntu, so that was quite impressive. It booted up and asked me the usual things, connected to Wifi, etc. The interface is still the same as it was last time I checked, unsurprisingly, however it seems to work much better now. The animations are smooth and it’s quite clean looking. 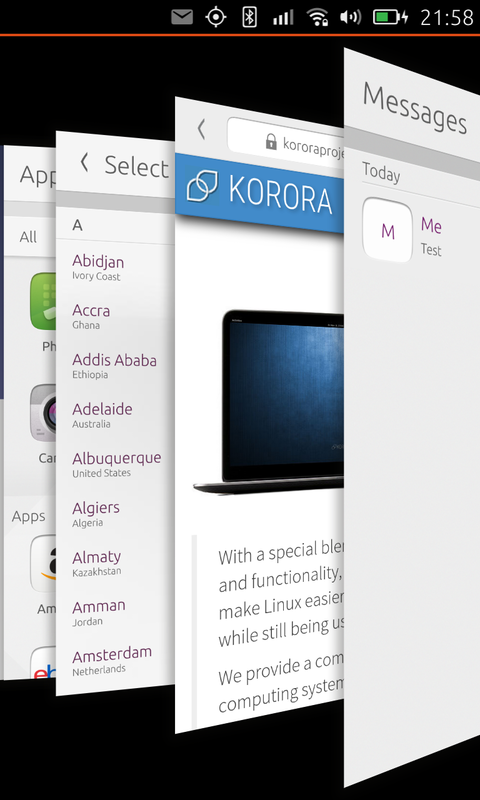 The Apps screen is easy to follow and you can easily filter by app group. Obviously things work slightly different to Android, for example I didn’t know how to close or switch apps. I found that quite frustrating until I accidentally kept swiping in from the right edge and a familiar looking sort of album cover of apps appeared. That let me switch to by clicking and close apps by swiping away (vertically, similar to iOS). You can also switch using a swipe from the left, which is like Unity I guess. I found that less useful as favourites are also in there and no differentiation between open or not. It sometimes also seemed get in the way though, like at the lock screen when you swipe to activate the pin screen; sometimes the quick draw would stay and sometimes it would flick you back to the lock screen, when you really wanted to just go to the pin. Anyway in terms of managing apps, the right swipe was more useful to me. My thumb kept going for the non-existent home button, but after a few minutes I got used to swiping from the edges (which was sometimes hit and miss) so I don’t think that’s a major hurdle long-term. I noticed occasionally apps jumped around when swiping, but once I realised how to switch back that wasn’t a problem, just strange. The other thing I miss is a back button. I assume the design is similar to iOS where the apps have the back capability and show it at the top of the app, but I like Android’s implementation much more. 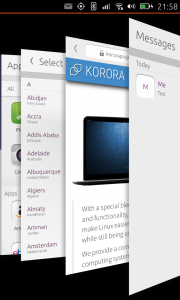 It’s very powerful and works kind of like a browser back button. There were some times when (in Gmail for example) I went somewhere like a tab that didn’t let me get back from. So not having a back button would take some getting used to, I think. I liked how it did the privacy thing like iOS, asking for permissions when apps were opened. Clock, for example, wanted access to my location. I’d like to see that extended more vastly to all apps and be very well supported, it’s one of my major gripes with Android and partly why I normally run Cyanogenmod. Device support and things like screen rotation was very responsive and the re-drawing of the screen very clean. I didn’t get many messages but the notification bar looks quite good, easy to use and the swipe left and right to select different settings like location, wifi, etc isn’t bad. I added a Google account and it synchronised my contacts down and overall that worked OK. The Gmail app did try to re-direct me to the Android calendar app though 🙂 Google Plus also redirected me to the browser and I had to re-log in, which was a pain with two-factor. Both side effects of using web apps I expect. So a bit of work to be done on the service integration side I feel, but it works at least. 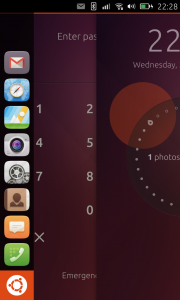 The one thing I didn’t test, and I don’t even know if it works yet, was the “docking” to convert it into a full-blown Ubuntu desktop. Overall, I think I could get used to the interface and perhaps even use it as my daily phone, if it wasn’t for one thing; it’s still quite slow. Apps take around 3-4 seconds to load, even after you’ve just closed and re-opened them, and that’s frustrating for an Android user who’s used to snappy response times. Once they are loaded though, they work quite well. I’m guessing there’s still some kind of debug going on, if so it would be cool if the stable image was stripped of debug and left that to the devel images. Overall, really quite impressive how far the phone experience has come. 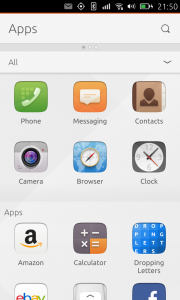 Kudos to Canonical and the Ubuntu Touch team! Been running the latest devel version (15.04 R1) for a week by now (Alongside with AOKP 4.4.4, Lollipop drains my Nexus 4’s battery waaaaaaaaaaaaaaaaaaaaaaaaaaaaaaaaaaaaaaaaaaaaaaaaaaaaaaay too fast) and the only complaints I have so far are kinda similar to Yours. Most of them aren’t that big of a deal (Minor crashes with the Ubuntu Store/Scopes, Camera app lacking tons of functions, blah blah) but the thing that’s been bugging me quite a lot is how long apps take to load. Even if it’s the dialer. Oh and it just literally feasts on my battery. But overall I’d say it’s quite good, considering how far we’ve come. I’ll give it a spin in another month or so and see if things have improved.